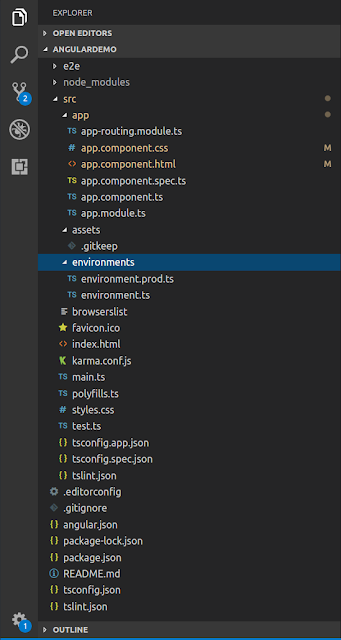 In this post, I will try to explain the directory structure and importance of various files and folders in the angular project that we generated. NOTE: This is for angular 7. Folder structure and file names might be different in previous versions of angular. We go try to see all the files and folders in the above picture and see what each does. e2e stands for end to end. This consists of your end to end integration tests. these tests are run as if it is a real user testing but are actually simulated one. This includes opening a browser, navigating to the page, clicking on UI elements etc. This uses a package called protractor. You can find more details about protractor in https://www.protractortest.org/#/. If you are familiar with node environment this requires no special introduction. Angular app is essentially a node package. You can see there is a file called package.json in the root folder of your generated application. It defines dependencies of your node package. So that when you run "npm install" these dependencies are installed. 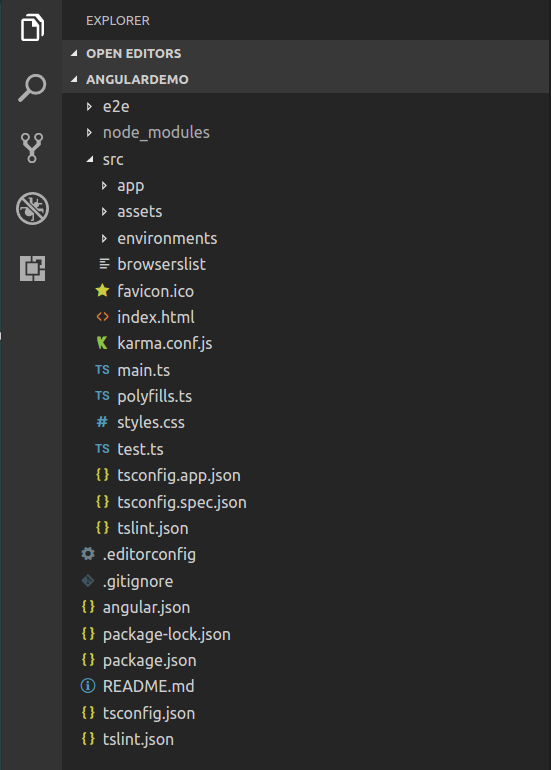 These dependencies go under a folder called "node_modules" which is in the same folder as package.json. This folder is the source folder of your angular application. 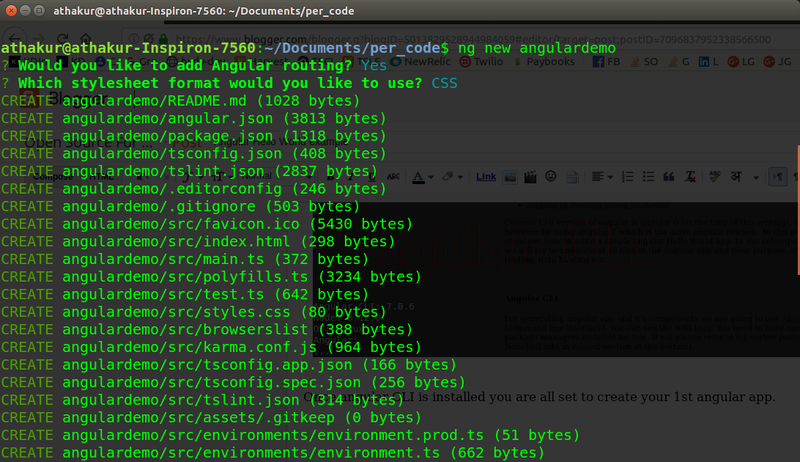 It contains all the source code that you write for your angular app to render. This will have files corresponding to your module, components, templates, css/saas files etc. 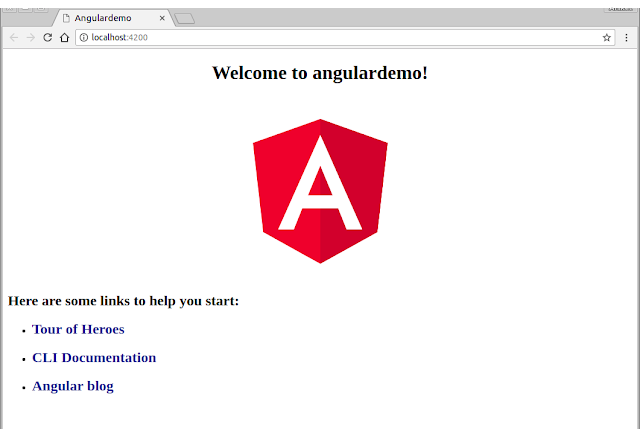 The angular app will have at least one module and component. As the name suggests this folder should store all your static assets like images, icons etc. This is the icon that gets showed when your browser loads your page. This tag corresponds to the selector of bootstrap component(app.component.ts) that is defined in your root module(app.module.ts). For example, IE may not support a File or a blob object. In this file, you can add your custom definitions. This file contains your common styles that are global to the application. It could be a css or a saas file depending on what you choose during creation of your angular application. NOTE: Karma is a great tool for unit testing, and Protractor is intended for end to end or integration testing. This means that small tests for the logic of your individual controllers, directives, and services should be run using Karma. Big tests in which you have a running instance of your entire application should be run using Protractor. Protractor is intended to run tests from a user's point of view - if your test could be written down as instructions for a human interacting with your application, it should be an end to end test written with Protractor. This file is required for doing the testing setup. 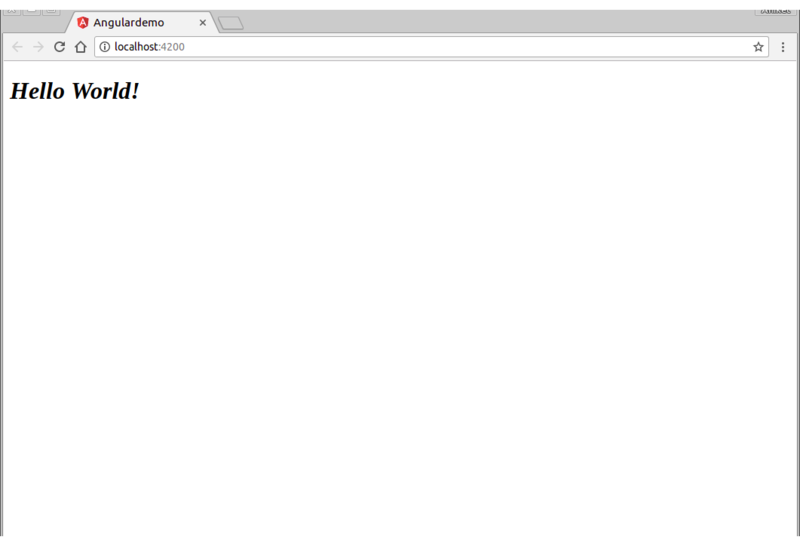 This file is required by karma.conf.js and loads recursively all the .spec and framework files. 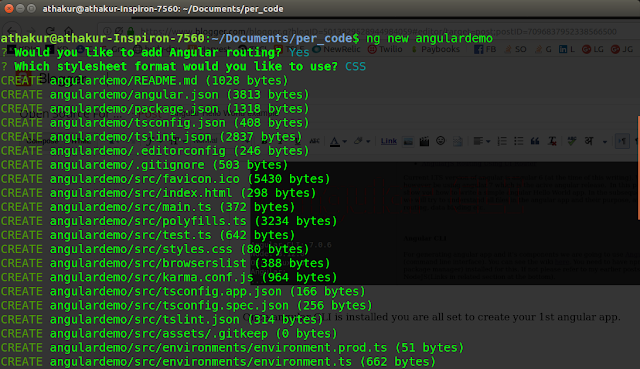 This is the main file from which angular configuration is loaded. If you see this file it will have reference to all files - mian.ts, indes.html etc. All configuration needed for your angular application to build and run resides here. 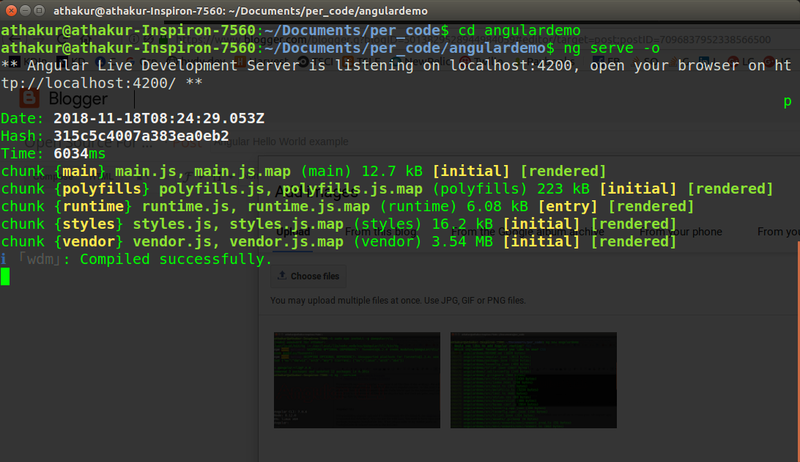 NOTE: In previous versions of angular this file was called angular-cli.json. As mentioned in node_modules section, package.json is a descriptor file for any node project. It defines project name, it's dependencies etc. This file has the liniting configuration. Rules that developers must follow to maintain the codebase in a standard way. This is a file that git understands and whatever you add inside this file will be ignored by git for version control. In some of the earlier post, we saw Angular JS which is the older version of angular. Current LTS version of angular is angular 6 (at the time of this writing). We will however be using angular 7 which is the active angular release. In this post I will show you how to write a simple angular Hello World app. In the subsequent posts we will try to understand all files in the angular app and their purpose, angular routing, data binding etc. 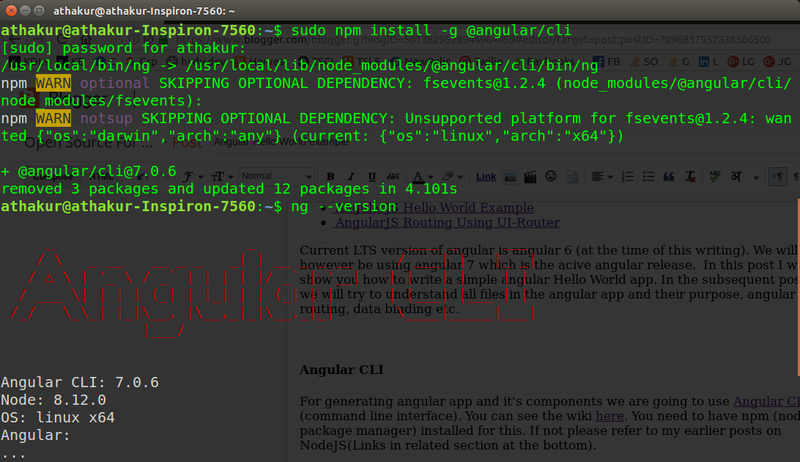 For generating angular app and it's components we are going to use Angular CLI (command line interface). You can see the wiki here. You need to have npm (node package manager) installed for this. If not please refer to my earlier posts on NodeJS(Links in the related section at the bottom). 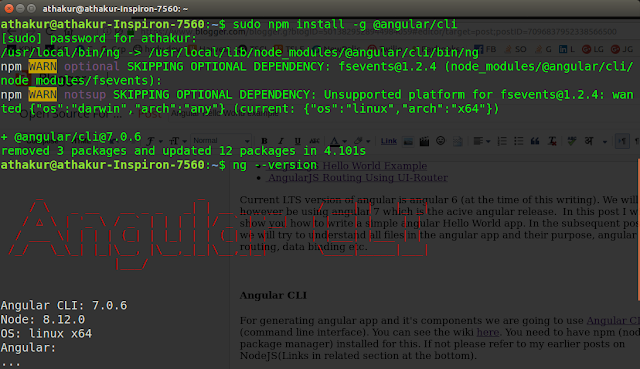 Once angular CLI is installed you are all set to create your 1st angular app. You will now be asked for choices like would you like to add routing to the application. Would you be using CSS, SASS etc? For now, select Yes for routing and CSS as an option. We will see this later. For our current demo, these are not really essential. Once done you can go into the project directory and run. This should build your app and open it in your browser. As you can see there are bunch of files here but not to worry. We will see each in time. In this post, we will see how we can make changes and deploy our own code. You can see the important files we would have to check. You can see the index file is "src/index.html", the corresponding type file is "src/main.ts". Similarly, the CSS file is "src/styles.css". There are other files but not to worry about it as of now. We will just worry about these files for now. This is the main module of your Angular app. A module can have multiple components. 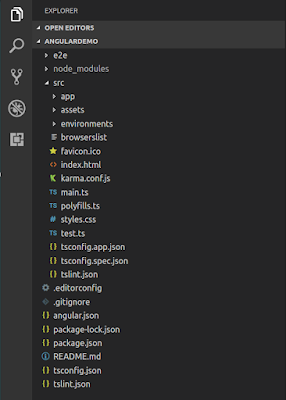 An angular can have multiple modules as well. You can see in the above example it imports 2 modules BrowserModule, AppRoutingModule. You can see where it is imported from. The important part to see here is the bootstrap part because that is the component that actually gets rendered on loading an angular app. So lets go to ./app.component file. Here you can see AppComponent is a component. Also, you can see it's selector is "app-root" which we saw in index.html. 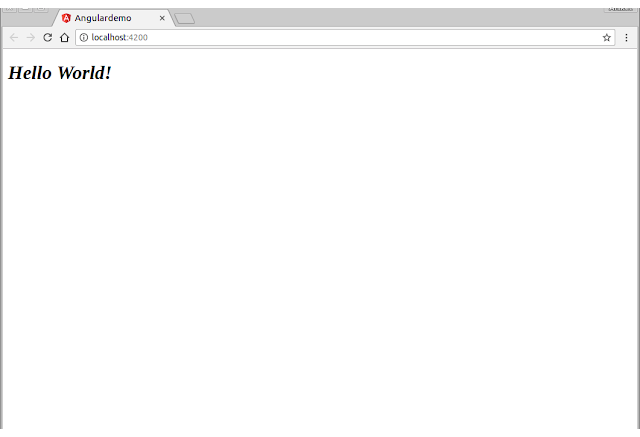 You can also see the HTML file and CSS file this component is using to render itself. So let's go its HTML file './app.component.html'. You can see this has some HTML code that got rendered when we ran "ng serve" command above. Time to make some changes. Remove this code completely and replace it with following code. That's it. If you already have "ng serve -o" command running your changes should get reflected immediately in the browser. If you killed the command, run it again and you should see the changes reflecting in the browser. You can see in above picture that "Hello world!" comes in h1 tag and in italics()as our class defined it.